Have you ever seen something that sparked an idea for a project? I hinted at an idea that hit me last December. It happened while I was watching the television show CBS Sunday Morning. 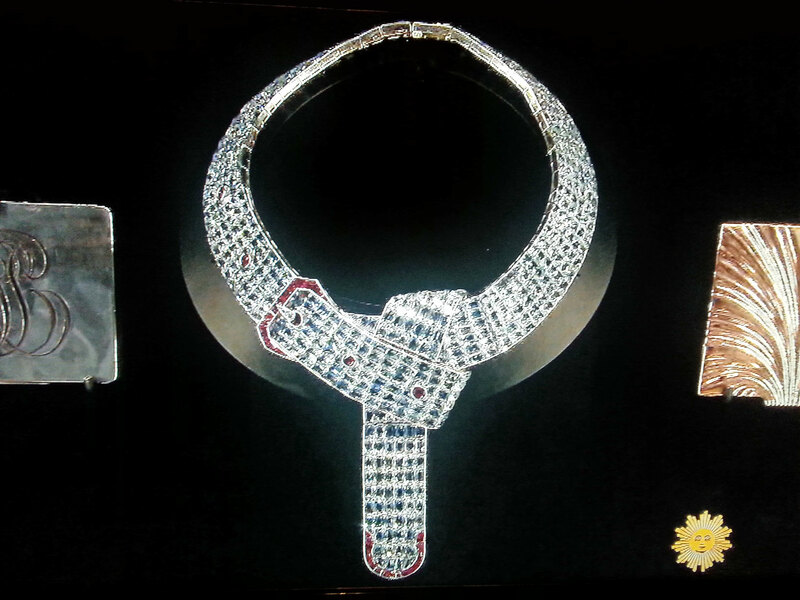 The story I saw was about the amazing jewelry designer Fulco di Verdura and a belt buckle necklace he created. What I saw inspired me to recreate his work as an inkle band. 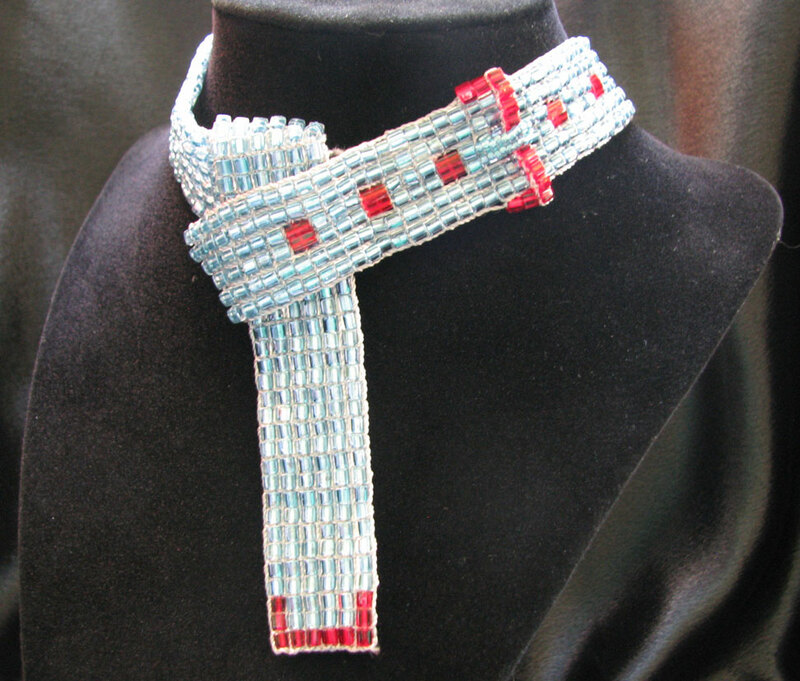 The result is this beaded inkle band belt buckle necklace. Here is his beautiful original necklace that appeared upon my television that fateful day. Isn’t it a vision of inkle band inspiring loveliness? Yes, this is an actual picture of the screen of my television. His necklace just screamed inkle band to me. 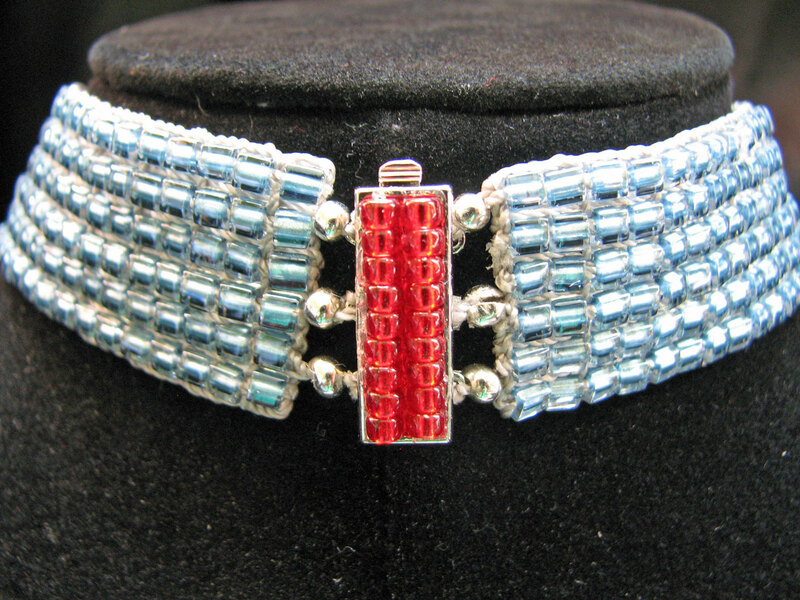 According to this article, it is made of platinum and set with 566 aquamarines and 39 rubies. 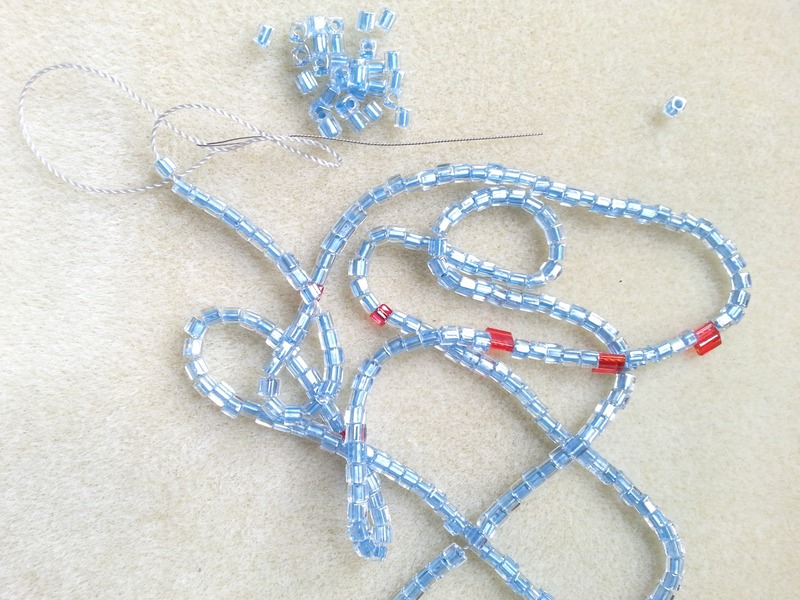 I needed to figure out how to weave a whole inkle band with beads. Both Anne Dixon’s book The Weaver’s Inkle Pattern Directory: 400 Warp-Faced Patterns and Helene Bress’ book Inkle Weaving talk about inkle weaving with beads, but in both books they are only adding a few beads here and there. In recreating Mr. Verdura’s necklace, I wanted to make a band as close to his design as possible, so in the end I used the method Helene Bress used of adding beads to the warp yarn before winding it onto the loom, just with many more beads! You might remember my post about sampling. Well, so I didn’t run out and buy too many beads, or worse, too few, I wove a few samples first. 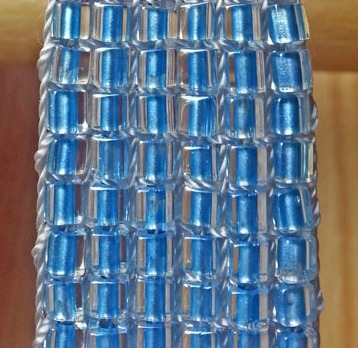 By doing so, I figured out that 7 rows of weaving with the beads equaled 1 inch (1.27cm) of band. Having that information helped me determine how many tubes of beads I needed in order to reach the length I wanted. (I bought extra. Beads have a tendency to spill when you have 3 cats and 2 little boys.) I put the beaded warp yarn on the loom, remembering to only slide the beads onto the unheddled threads. Sampling also showed me it is best to start and end with a non-beaded heddle thread. When I didn’t do so, the selvedges were wobbly and would curl under the beads. The warp for this band is only 13 ends wide, but I think I would do the same process for a beaded inkle band of any width. Phew, no more wobbly selvedge. For both the warp and weft I used Omega brand nylon crochet thread, which was slippery enough to allow the beads to slide easily into place. (Sometimes too easily!) 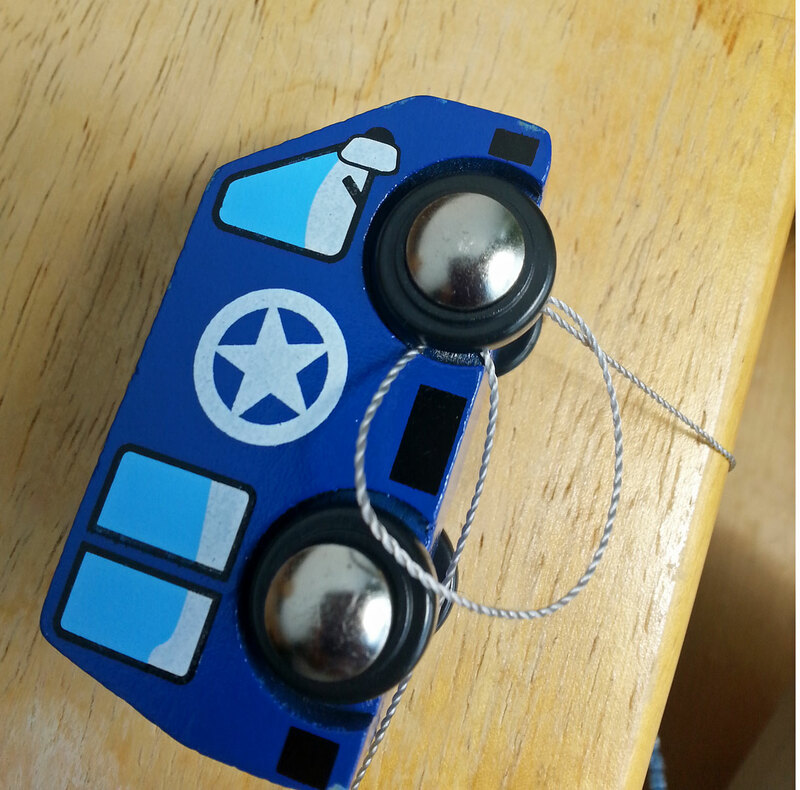 To weave the beads into the band, I opened the shed, passed the shuttle, slid the beads into place, changed the shed, beat, then passed the shuttle and slid beads into place again. This process securely locked the beads. 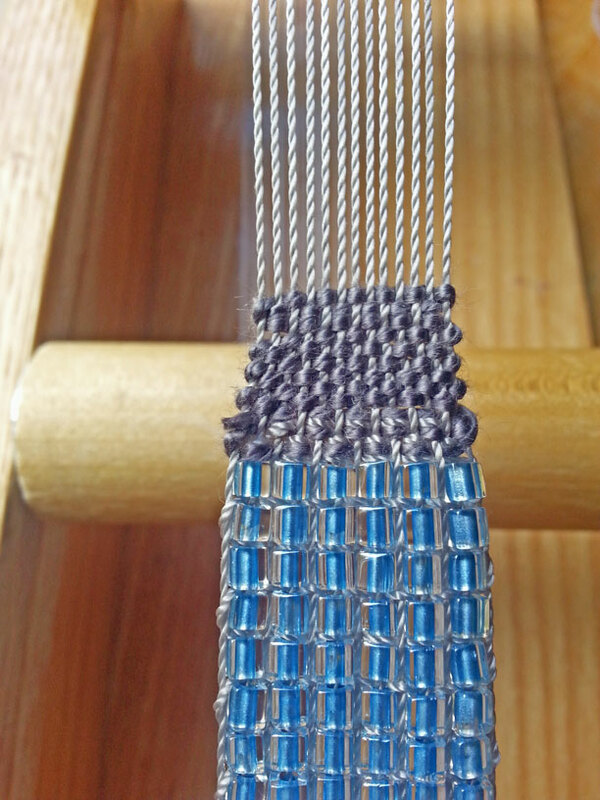 Weaving with the beads essentially causes the band to be a balanced plain weave instead of warp-faced, but the color of the yarn recedes so it still looks warp-faced. One of the challenges of creating projects with inkle bands is that there is always a fringe to contend with and I wanted a clean, fringeless edge. What to do? My answer was to only weave one pass of the shuttle before adding a row of beads. 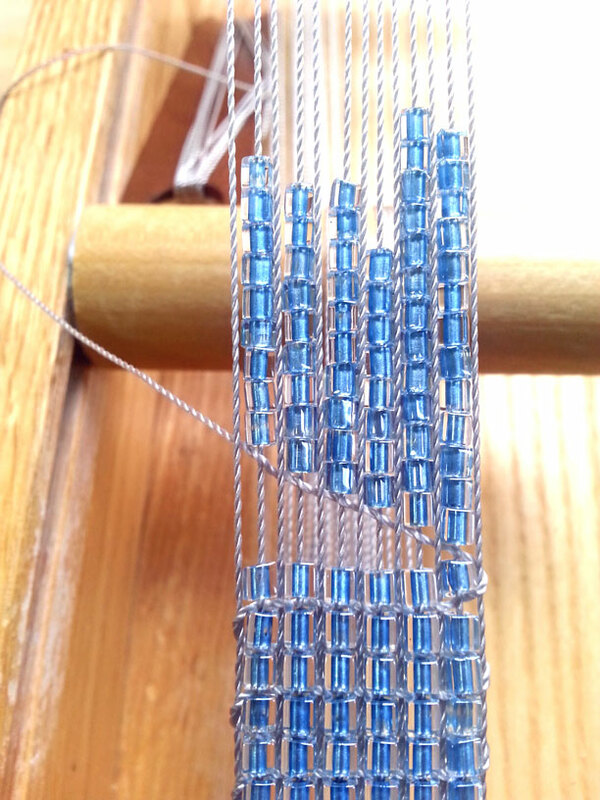 The beauty of having the beads on the warp is that I was able to weave the fringe back into the beads for a finished, secure edge, that did not ravel. 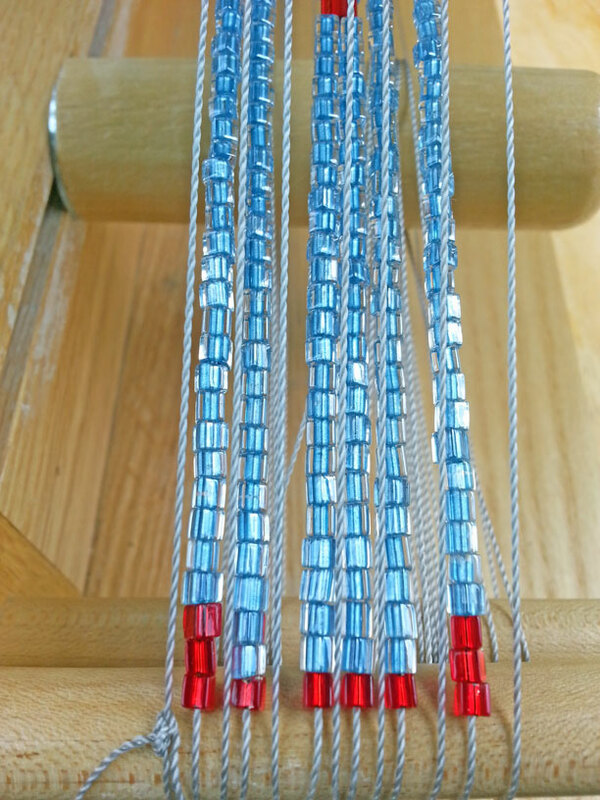 The bead holes are big enough to allow for three strands of fringe to be passed back through without too much effort. The necklace is actually two pieces. Since it was not made out of fabric, I couldn’t just cut it in half. Instead, while the band was on the loom, I wove a predetermined length, ended it with one shot, advanced the warp, leaving about 12 inches (30.48cm) of unwoven warp and began weaving again, with a clean edge start. But, for the second piece I ended it with about a ½ inch (1.27cm) of plain weave with 3/2 cotton as the weft. 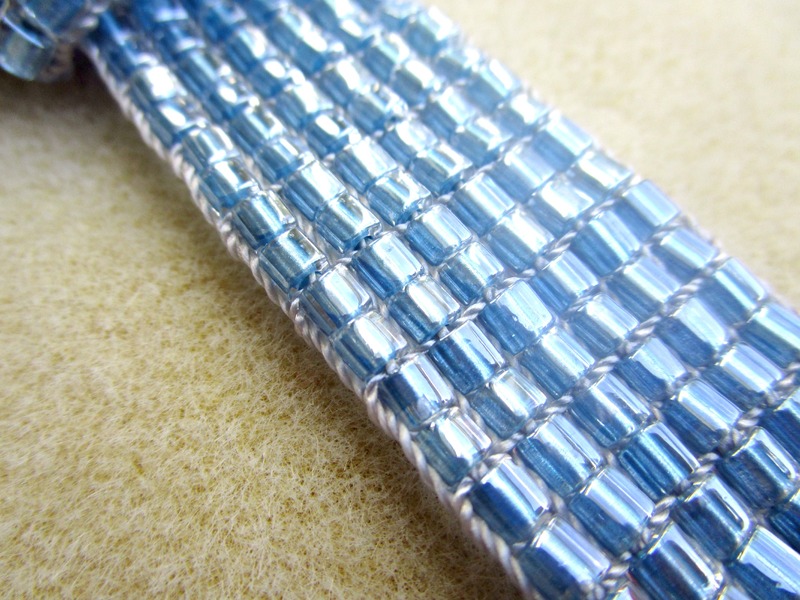 This end was then sewn to the back of the band to connect the necklace and make it look like one continuous band. One of my favorite things about the necklace is the clasp I found in the Etsy shop Golden Twin Clasps. The lighting (ahem, not the photographer) makes this look like a necklace made with lighter beads. 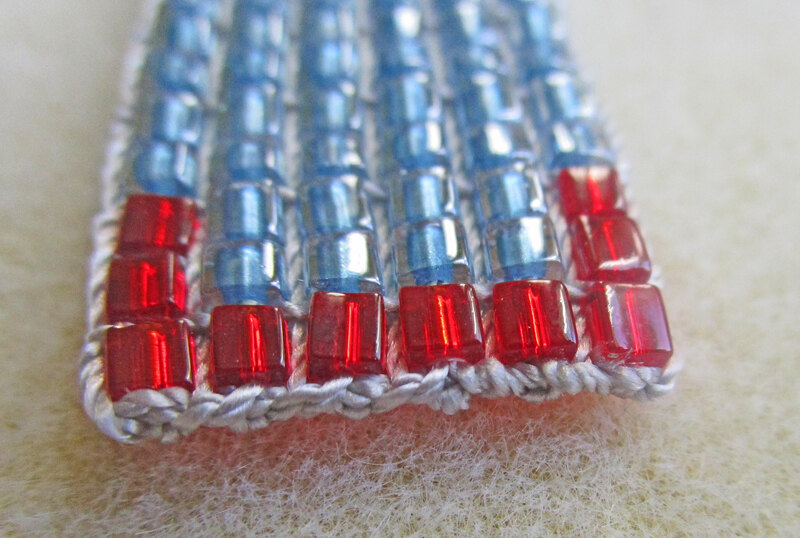 And, that is how I wove with beads to create my beaded inkle band buckle necklace. Thank you, Mr. Fulco di Verdura for the inspiration. Want to see the story that started it all? You can watch it here. I admit, I love the way my necklace turned out! It has a beautiful drape because of the nylon crochet thread and a pleasant weight since it is woven with beads. My necklace may not be set in platinum with aquamarines and rubies, but it sparkles and feels great on. Yup, it meets all the criteria I have for jewelry! How about you? Oh, and I did finish the necklace in time to have it for the fashion show and fiber exhibit at the FTWG Conference back in March. It was close, but I did it! Thank you, Amanda! It was fun to see it come together. Beautiful. And gives me an idea: have you ever done beadwork on a loom? Very close to the same idea, except the warp doesn’t carry the beads, the weft does, and once you place the beads and change sheds, you go back through the beads you just placed with the needle, so they’re secure on both sides. Might be easier than trying to bead all the warps…holy cow! I really wanted to see if I could do it in inkle weaving, since that’s “thing”. But, actually, one of the methods I tried was, as you say, putting the beads between the warp threads like in bead loom weaving. It didn’t give me the look I wanted, mainly because the beads were laying horizontally instead of vertically. I’ve seen someone do it with really big cylinder beads and it worked well. It would be interesting to see how it would work with seed beads, though. Seed beads would be interesting. But they’re so small that the warp couldn’t be any thicker than bead string, or the beads would be overwhelmed. Hi Pamela! I will, I will! I know it’s been a couple years but I just found your blog and am reading from start to current…I showed this to my husband and he says, between the two necklaces, you win! 🙂 Thank you for sharing! I’ve got 2 inkles on order and can’t wait to play!! I am so glad you found me! Life is moving at such a pace that I have a hard time finding time to write. Hopefully, you can find some project inspiration here. Keep inkling and feel free to share you projects!